Billericay won the Isthmian League Cup for the first time in their history as they produced an irresistible performance to sweep Tonbridge aside in a thrill-a-minute Final tie. Jack Giddens was given a start between the sticks with Danny Fitzsimons replacing the injured Rob Swaine in defence. 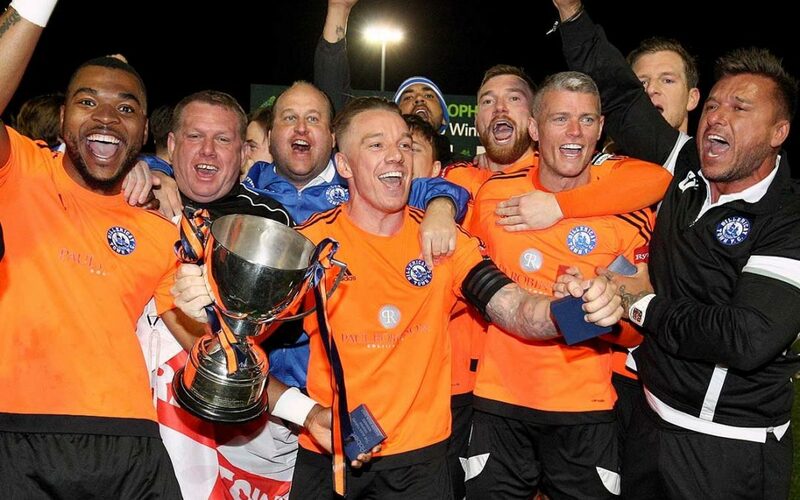 Also coming back in to the eleven was Captain for the night Jamie O’Hara who replaced the cup-tied Ollie Sprague. The “Oranges” were quickly out of the blocks as Billy Bricknell pulled an early attempt wide of the post. Jake Robinson then saw his shot blocked with the rebound falling to Adam Cunnington who lifted his effort over the bar from 12 yards. Robinson had another effort blocked before Tonbridge raced down the other end to take an early lead. Luke Blewden fired in a powerful shot from the left-hand channel, which Giddens did well to parry but experienced goal-poacher Andre McCollin was on hand to tap in the rebound. Billericay didn’t let this early setback affect them and they continued to force Tonbridge back. The over-worked Henly in the Angels’ goal saved a ROBINSON header before the Blues’ record signing made the game all-square as he collected the ball on the right-hand side before cutting inside his full-back and rifling a shot beyond the keeper into the far corner. Billericay were dominating the game and Bricknell gave himself another sighter as he held off Parter and shot narrowly wide. ‘Ricay should have had a penalty as Cunnington was clearly hauled to the ground and O’Hara shot narrowly over before they made their pressure tell. Robinson’s initial drive was well-saved by Henly and the ball was recycled out to BRICKNELL whose shot from the edge of the box found a gap at the near post to nose Billericay in front. Billericay were rampant now as O’Hara saw another effort clear the bar and Bricknell headed an O’Hara free-kick just off target. Billericay scored a third after 36 minutes. Eyong showed his tremendous work-rate and desire to dispossess the beleaguered Parter and he burst into the box before finding Robinson who laid the ball into BRICKNELL’s path who smashed it home from 15 yards. BRICKNELL was playing like a man with a point to prove and he completed a quick-fire hat-trick just before half-time as his shot deflected off a defender and looped over the helpless Henley and into the net. It was Tonbridge who made a half-time double substitution as The Blues came out for the second-half unchanged. Billericay were straight back on the attack as Robinson headed a Lawrence cross over the bar under pressure from a defender. The Blues went nap after 48 minutes as another good cross from Lawrence found its way to CUNNINGTON who gleefully shot home from 10 yards. Tonbridge pulled one back a minute later in bizarre fashion as Akrofi’s deep cross was headed into his own net by Konchesky. Billericay were relentless in attack though as the Angels crumbled under the non-stop barrage of pressure. Jamie O’Hara sprayed a superb ball out to Robinson on the right flank and his cross was met by the on-rushing LAWRENCE who finished low and hard into the corner. Henly denied Robinson his second as he dived to his right to push away the striker’s fierce shot. There was still half an hour to play when Billericay made it seven. A long throw from Matt Johnson was only partially cleared and it fell to CUNNINGTON who smashed a half-volley into the roof of the net in the latest of the series of superb Blues’ finishes. Billericay made a couple of changes ahead of the weekend’s big game with Leatherhead and perhaps understandably given the score, their intensity levels dropped slightly allowing Tonbridge their best spell of the game. Giddens was forced into a couple of decent stops most notably from Tonbridge substitute Luke Allen. Town made it eight with seven minutes left on the clock with good work from two substitutes. Assombalonga raced onto the ball in the inside-left channel and his cross-shot was beaten away by Henly but it fell to KRASNIQI who forced the ball over the line at the second attempt. Tonbridge managed a couple of shots from distance but Giddens was equal to Wheeler and Akrofi’s efforts. He could do nothing about another Wheeler effort that came back off the bar and it was far too little far too late for the Angels as they scored a third near the end with McCollin topping and tailing the evening’s entertainment. The final whistle went shortly afterwards and the Billericay team, management and supporters all celebrated their emphatic victory together as one. Giddens, Eyong, Lawrence (Taaffe), Konchesky, Fitzsimons, Ellul, O’Hara, Johnson, Bricknell, Cunnington, Robinson (Assombalonga). The video contains some strong language.